The photo is one of four panels for a couple of smallish side-tables I’m making for a client. These will form decorative rails below the table top. It’s all a bit experimental, but so far the client seems to be happy. 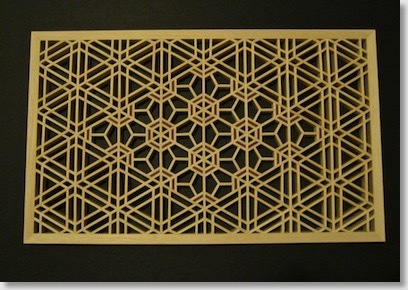 Because these panels have complex patterns, the side-tables themselves will be quite conventional and straightforward. 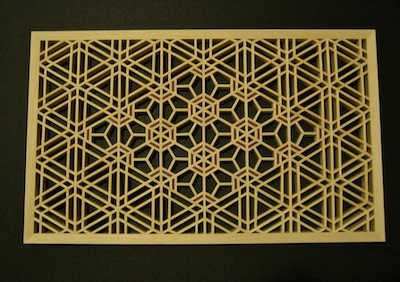 Too much of a stylised design would detract from the kumiko panels, and vice versa. The patterns are sakura (cherry blossom) in the middle, and goma-gara (sesame) on the outside. It’s been a few years since I made either of these patterns, so it was a bit like getting back together with some old friends. The goma-gara was the second of the triangular patterns I learned at the College. The mitsuke (thickness) of the kumiko is 1.5 mm, the pitch of the mitsu-kude is 34.1 mm, and the overall size of the panel is roughly 250 x 150 mm. The wood is silver ash, and the internal pieces of the sakura are laminated silver ash and purpleheart. The four panels for the second side-table will be a different pattern mix.